My two months interning with CUCE-NYC taught me how important it was to empower people in the community and to motivate them to eat healthier food. 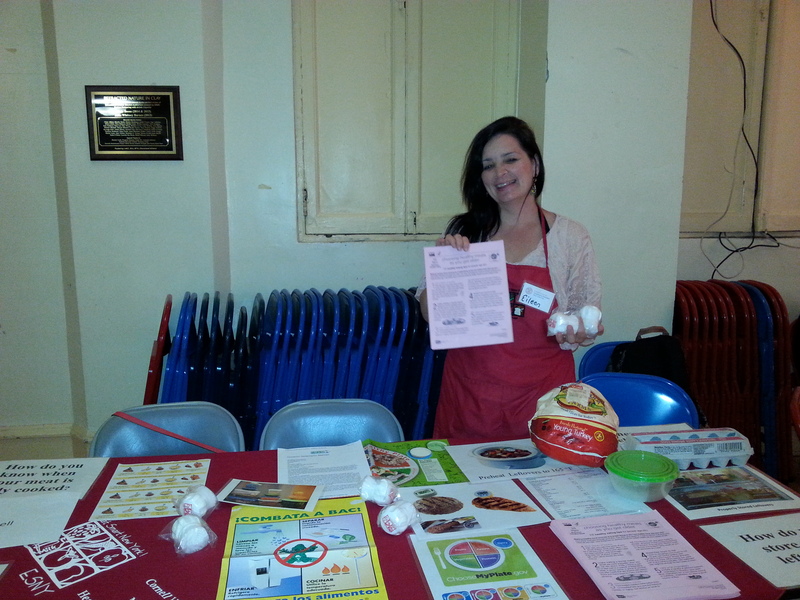 As a dietetic intern I was able to be part of the CUCE-NYC team in teaching the general public how to increase their vegetable intake without spending too much money or time. I had the opportunity to work at several farmers’ markets including the ones at Jacobi Hospital, Mt.Sinai Hospital, Jamaica, Boro Park Greenmarket, St. George on Staten Island, and Elmhurst Hospital in Queens, NY. Observing CUCE-NYC’s “teach-back” sessions helped me gain further respect for what the CUCE-NYC community educators are doing for people in the community. They are helping families to live healthier lives so that these families can grow and help their communities. One Wednesday afternoon in September I had the wonderful opportunity to help a woman realize hope. I was helping out at one of the farmers’ markets stands outside Mt. Sinai Hospital in Manhattan when a 30-year-old Caucasian woman walked up to our booth. She was terribly upset and crying. Her parents were accompanying her. She told me she had been recently turned down for bariatric surgery because she was 50 pounds overweight. She had to lose the excess weight to be eligible for surgery. I offered her a sample of our delicious vegetable stir-fry and she loved it. She said she never ate any vegetables because she didn’t like them and didn’t know how to cook them. I introduced her and her parents to herbs, new produce and the importance of portion sizes and of maintaining a healthier lifestyle. Her parents were encouraged and they said they were going to increase their fruit and vegetable intake. I saw them buy the produce to cook what we had just made in front of them. That single moment was the highlight of my internship experience! Another highlight of my internship was the visit to the FDA building in Jamaica with the CUCE-NYC team. It was an unbelievable experience to go on a personal tour of one of the U.S.’s top governmental agencies responsible for protecting the nation’s food supply. It was a joy working with Linda Ameroso who does so much for her interns and colleagues. She is a leader who empowers everyone around her. I have such fond memories and I am thankful to everyone at CUCE-NYC. Keep up the great work because you are making the world a better place! Bio: Eileen Ludrosky interned with CUCE-NYC as a dietetic intern under Linda Ameroso from Sept. 1, 2015 to Oct. 30, 2015. Learn more about our Nutrition and Health Education programs here. This entry was posted in CUCE-NYC INTERNS and tagged Cornell Cooperative Extension, CUCE-NYC, dietetics, food, health, health tips, healthy lifestyles, healthy recipes, intern experiences, nutrition. Bookmark the permalink.